Did the freight locos (with the doghouse on the tender) also pull passenger trains? This will help narrow my decision. I like the tender with the doghouse and also the early version. At the very end of the steam era, all J's got doghouses (even the 611). Unless Lionel corrects it, the 600-604 J's did not have alligator crosshead guides. The 605-613 did. One time I had the book Extra South by H. Reid (a Norfolk newspaper reporter who as a hobby took photos of steam mostly in VA during in the transition period. He had one photo of J doing wayside switching outside of Suffolk with the dog house. The pre war built J's came with the Laird type(with no bottom guide) like on the UP 844. Would it have been too costly to change the crossheads on a early J (600-404) which Lionel is doing to use the type crossheads on say the UP 844 which Lionel has also done. One of my main gripes with the many different editions of the N&W J's from both MTH and Lionel is incorrect running gear. I really hope Scott over at 3rdRail produces a "J" one day. Wishful thinking I guess with the number of J's currently on the market. Look at this one Jeff. I like the dog house also. Glad to see it pulled passenger cars as I was going to get another one. Born in Bluefield, college at Tech, age 8 moved to Suffolk. Videos look like old home week. Good memories/experiences. Curious question, would crosshead guides have been retrofitted on steam engines? I tried(real quickly) looking at pics of 603 and it is hard to see anything conclusive. Maybe they popped them on some time later? Not sure what you are asking here Dave. The 600 - 604 were built with multiple bearing crossheads. They kept them for their entire life. 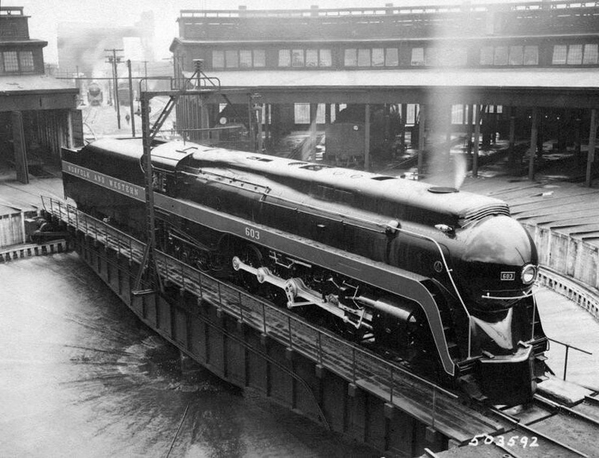 605 -613 were built with Alligator crossheads and kept them their entire life. There was no swapping out between the two. Well Big Jim, that answers the question. You always here things about equipment being retrofitted with something that wasn't on the original design. The retrofitting usually in more recent times other than buying completely new equipment is mostly for safety reasons. I sort of doubted that this would be the case but figured I'd ask for clarification. It would be nice if they would have the model completely like the real deal, but you know how that goes. One thing also that is not listed are drop plates. I had said yesterday on one of the Hudson topics that there is no indication if they would have them or not as it isn't listed. The VL Niagara has a drop plate, the Berks, and I believe the S3 from the most recent catalogs but it does not state that anywhere in the catalog. I suppose that if we wanted to know if the 600 and 603 were going to have the correct crossheads, we'd have to talk to Dave and see if he would be able to answer that. Sorry to ramble it bit. Thanks for the information Big Jim. I am not familiar enough with the way Lionel has the cylinders cast. One would think that it shouldn't be such a hard thing to do in order to install the multiple bearing crosshead. One other thing that I haven't looked at, because I don't need another J, is the tender. There is a difference in that engines 600 - 610 have a roll-top tender deck and 611 - 613 have a flat top tender deck. Lionel did get this right with the original scale J 605 and 611. I like my 605 with the roll-top. MTH did make the flat-top tender, but, I have no idea if they ever made a roll-top for the earlier versions. Big Jim, thanks for posting the great video. Big Jim great video thanks for posting. FWIW I have MTH J's #604 (Shrouded) and 605 (Unshrouded). Both have the flat top tenders. Alas, what's a soul to do, eh? My guess is that they will probably use the same bits they did with the last J's they ran. People such as myself wouldn't know the difference, but the scholarly people who know will. Either way, they will sell because of other new features like whistle steam this time around. I myself didn't get a J the last time they offered them(a little late to the show) but I said to myself that they'd be back around. I went for 603 because of the doghouse. I also went with the cavalier cars because I actually have an old set of MTH N&W cars from way back when. I never did get the engine that went with it, but that's okay. It would be an odd thing to have the doghouse on the tender (late 50s feature) pulling passenger cars with skirts on them which went away before the middle of the decade. Big Jim great video! With a bit of Southern thrown in!! What monsters they were!! !